News, Research and Commentary about the Floyd Landis doping allegations. October 06: documents released by Landis. November 06: "No Documents For You!" One of TBV's sons gives Landis a "thumbs up" at the Tour of California, February 21, 2006 -- before things got complicated. One of the arguments offered by those who think "Landis doped" comes from blood values that were presented late in the process. These never really came up in the litigation, because they aren't relevant to the issue of testosterone doping which was the charge. They are arguably relevant if one is suggesting that Stage 17 was enabled in some way by Oxygen vector doping, through either some EPO-like substance or blood doping. The argument being made is based on a single datapoint in the collection of Landis hematology data, the reported hematocrit value on 11-jul-2006. This was after an easy stage following the first rest day of that tour. Figure 1: GDC 1372, located in the GDC Binder on PDF page 1801. UCI collected hematology values for Landis. Figure 2: Edited version of Figure 1, more legible. The question that is asked is, "does a rising hematocrit 11 days into the tour indicate doping?" And the assumed answer is, "of course it does, fool!" Well, fools we may be, but that's not necessarily a supported conclusion. As we know, the UCI limit is 50, and while 48.5 is high, it isn't pushing the 50 level hard, so there's mandatory cause for a "no start" by the UCI. But this isn't the only answer. We well know that hematocrit is very sensitive to hydration, and we don't have any data to indicate Landis' condition on that day. The reported value is also sensitive to the particular machine being used, and its calibration. Phonak, which was the first team to start trying internal controls of any time, checked rider's HCT on its own, and would not see the UCI values. The internal limit was 48, to be sure of clearing the UCI limit of 50. How then did Phonak let a 48.5 slip? Probably because their value wasn't 48.5, or because they knew something about Landis' hydration state that would explain an upward fluctuation. If one goes back to Velonews TV interviews during the period, you can hear that Landis has the rattle of a cold. Did a cold cause underhydration with fluid loss, or did some treatment he got do so? We don't know, nor do we have Phonak's internal control values, which seem not to have been recorded. So, what can we say about the raw 48.5 hematocrit? Unclear. Since the argument that it means something is about contextual understanding, let's look at some more context. We'll start with the other values reported in the UCI document, the Hb and Reti (reticulocytes) values. Perhaps because of the UCI's old fixation on hematocrit, many of us similarly key on that value as an indication of clean racing. But according to Ashenden, it's one of the least important. Hematocrit, or the percentage of total blood volume that is red blood cells, fluctuates by large amounts in even normal human beings. It's susceptible to issues ranging from the subject's hydration to proper sample transport (improper refrigeration causes RBCs to swell, disproportionately increasing their volume). One of the first things that Ashenden noted in examining results was the variability between official UCI figures and ACE figures, even for values taken just days apart. The UCI numbers were vastly more uniform. "Almost like a different person," said Ashenden of some of the ACE results. What does Ashendon look at instead of Hct? "The first thing I look at in interpreting results is reticulocyte count and OFF-score, then hemoglobin," explained Ashenden. "I also look at anything about a sample that is strange and might explain off values due to transport and testing issues - mean cell volume and hematocrit chiefly." Extracting values by eyeball from the graphs that are published in the article, we get the following values for Vande Velde and Millar. To see if our data and off-score calculation method is correct, we pulled out the reported off-scores with the ones we calculated, and they are all pretty close, so we think we have decent data and computations. Due to the vagueness of the graphs, the dates are approximate. Table 1: Vande Velde's data from Slipstream. Table 2: Millar's data from Slipstream. As we see, there is nothing in the Landis data that is out of the range of normal; if anything, it is more normal than Millar's. 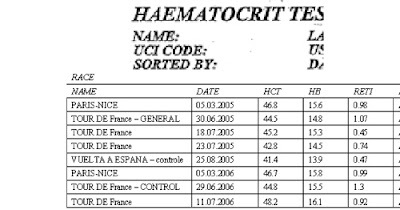 We note also the absence of other hematology data from the UCI, even though Landis has blood taken on other occasions during the tour. In particular, there are no blood values offered for after the one in question, and we're working from two data points and trying to find enlightenment. Well, what was going on in the tour from one data point to the other? Not very much. It was pretty much a week off, as we see from the stage descriptions and the data reports that Allen Lim made at the time, and which are also in the exhibits. Things indeed got much harder right following - 5870 kj vs. 3500 average in all preceding. It's not unreasonable to think Landis was recovering from hard training before the tour during the first week, which might also account for some HCT rise independant of hydration issues. From this, we offer the following thoughts. Raw HCT values are problematic, as testified by Ashendon. Landis' values for Hb and reticulocytes are pedestrian, or at least comparable to those of "clean" riders provided by Slipstream. If one wants to draw any conclusions against Landis from the hematological data available, then one ought to wonder about Millar's first off-season value. “Going from 15.5 to 16.1 (in hemoglobin) is not that unusual when not competing,” Ashenden said by phone from Australia. “But it is very unusual to see an increase after a hard week of cycling. You'd expect it to be the reverse. You'd expect that to fall in a clean athlete. An increase like this in the midst of the Tour de France would be highly, highly unlikely. the July 11 test came the morning after the 2006 Tour's first rest day, and actual doping diaries seized in last year's Operation Puerto investigation in Spain indicate rest days are the preferred time for reinfusion of blood bags during the Tour. You know TBV, I'm kind of surprised you bothered. It's no better an argument than the old "When I saw him win that stage that way, I knew he doped" argument. Pointing out all the flaws doesn't matter, because the argument is just a rationalization for their feelings, and you can't change feelings with rational arguments. And generally, the rabid anti-doping people want to believe that the human body runs like clockwork. The tests are all designed with this. In their universe, deviations from the norm are unthinkable without doping. Now we are getting somewhere that may be interesting. What natural factors would go into a increase in Hb, and what go into a decreasing one? Could sleeping in an altitude tent reduce plasma, and thus increase the concentration of hemoglobin rather than increase the number of red blood cells? Does Hb measure concentration of hemoglobin or the number of red blood cells? The benefit of sleeping in an altitude tent might be to increase the blood’s oxygen carrying capacity by fast acclimation to altitude without increasing the number of red blood cells . I'm no scientist and these are not rhetorical questions. Maybe I'm just being obtuse? Did Floyd even sleep in an altitude tent? Well, fine, if we have to. A high hemoglobin count (and 16.1 does NOT qualify as high) can be caused by deyydration. The same thing that can cause a high hematocrit. What a coincidence. fall with hematocrit (which measures volume of red blood cells as a percentage of total blood volume), because in normal circumstances your red blood cells all contain about the same amount of hemoglobin. So, if you're dehydrated, your crit and hemoglobin both rise, fairly linearly. Oxygen tents don't dehydrate you. They do cause your system to produce natural EPO. But new red blood cells wouldn't show up for a few days. I seriously doubt Floyd used an oxygen tent during the tour. You want to maximize your recovery after each stage, and depriving yourself of oxygen might not be the best thing in the world. So, before the tour, a responsible contender is probably doing things to boost his hematocrit, like altitude training, sleeping in an altitude tent, taking iron supplements. And as we see, Floyd's highest reticulocyte percentages both occur pre-tour. Nothing outrageous, but elevated a bit. So before the tour he's growing new red blood cells. Some are released into his blood. If he's really doing the altitude thing, his body goes into overdrive, releasing some early (meaning they have a longer lifespan in his bloodstream) and growing a bunch more new stuff in the marrow, which will be ready in a few days. If we used our crystal ball at this point, we would forecast that in a week or so, he'd have a lot of fresh new red blood cells, raising his crit and hemoglobin counts. Also, his reticulocyte count should begin to fall, as his body stops the overproduction. And that's what his test shows. It seems that most people haven't figured out a strategy of having relative weakness in Hct/Hb early in the tour, with things coming around in the second half. Maybe it is because they didn't think of it, maybe they think optimizing other parameters is more important, or maybe they don't feel that they can afford the weakness during that time period. I suppose it would be interesting to imagine what kind of relative training load pre-tour would lead to these kind of results, given (a) the known lags in training to reti production to raised Hb; and (b) the documented tour work loads that would need to be considered relative rest from the training workload stimulus. There have been hints Landis used a tent during the tour, which many people find hard to understand, thinking it would weaken recovery and be counter-productive. False information, red-herring, mistake, or secret-sauce, we don't know. Musing, I like that Bill! So I will muse too.... IIRC the GC guys didn't have to work to hard in the first week, maybe my memory is faulty. If this is correct, perhaps being protected and all, he felt he could afford a little time in the tent early on? Reportedly, the problem with sleeping at altitude is that it is detrimental to recovery. My understanding is that the altitude tent users set the artificial altitude to balance the positive effects against the negative ones. I don't think athletes use the tents when they're in competition, as recovery is the paramount concern, but I don't know for certain. I THINK you can contact the Phonak doctor, or at least Dr. Baker can -- she may have documents for the athletes. I know she used something for TH's defense back in the day. Medical records collected by doctors have messy associated legal and privacy issues, and we're crossing multiple countries as well. Phonak the team is no more -- who knows what happened to records in liquidation. They might properly have been destroyed. Even confirming if some records exist(ed) might be tricky. Worth asking about, but a thin prospect, I think. Before saying anything else: TBV, this is OUTSTANDING work! A first-rate piece of analysis. Based on everything I’ve read and everyone I’ve discussed this with, what you’ve written here is very close to how professionals in the area would analyze this data. And when I say “very close”, it’s not because you could have done this analysis any better, but because the experts themselves do not agree. FWIW, I can confirm that TBV IS correctly computing the Offscore value from the available data. I’ve confirmed this by finding online authoritative calculations of Offscore that perform calculations in the same way TBV did. I’d like to add my own take on this analysis, for what it’s worth. First of all, it’s clear that no expert would look at one piece of blood data and conclude from it that someone is doping. The best anyone can do is to look at the numbers for a particular athlete and say that further investigation is warranted. Tenerified reminded us here of the Ashenden quote about Landis’ Hg increase from 15.5 to 16.1 during the first 8 days of the TdF. Apparently, Ashenden called this increase “highly, highly unlikely”, but according to a study I’ve seen from a WADA lab (I’ve provided this study to TBV, if he wants to post it), you’d expect to see such an Hg increase about 25% of the time. I wouldn’t argue with Ashenden if he wanted to do more testing on this 25% of the rider population, but a reading you’d expect to see 25% of the time is not ALL that suspicious. Tenerified points out that the July 11 test came the morning after a rest day, and argued that rest days are the most likely day for blood doping. But the Landis data is not consistent with blood doping. For blood doping, the experts look not just at Hg and hematocrit, but just as importantly at the reticulocyte count. If an athlete blood dopes, the reticulocyte count should drop dramatically, as the body senses that it has more red blood cells than it thinks it needs, and stops producing new blood cells as a result. So the experts are looking for a high Hg number combined with a low Reti number, and this combination of numbers is PRECISELY what the Offscore is designed to measure. Landis’ July 11 Offscore of 103.45 is a VERY NORMAL number. According to what I’ve read, you’d need to see an Offscore of 133 or higher before you’d have serious cause for concern. Supposedly, it was the fact that Tyler Hamilton had a reported Offscore of 132 that led authorities to become suspicious that he might be blood doping. A second point to make is that if you want to look for data to confirm your suspicions about a particular rider, this is an easy thing to do. My understanding is that Ashenden is correct: as a general matter, you WOULD expect Hg levels to drop during the course of a long race. The reason for this is that as the race grinds on, the rider’s red blood cells are working so long and so hard carrying oxygen to the body that they simply wear out faster and die younger than they would normally do. But if you’d generally expect Hg levels to drop, you’d also generally expect reticulocyte levels to rise, at least modestly, as the rider’s body works in recovery mode to produce more red blood cells to replace the ones being lost. With this trend in mind, we could point out that the reported 7/16/08 reticulocyte count for Vande Velde and Millar go against the trend, as they’re both quite low. You’d expect to see their bodies working hard to make new blood cells, and the data’s not showing that. Please don’t get me wrong. I’m as confident as an outsider can possibly be that Millar and Vande Velde rode a clean 2008 TdF. There’s nothing abnormal about their Offscores. All I’m trying to point out is that there will probably always be something in a rider’s blood numbers that will be inconsistent with some trend you might expect to see there. The final thing to point out is, I wouldn’t take any of these numbers all that seriously. There are built-in difficulties in taking these measurements. We discussed that the measured Hg levels will be affected by a rider’s dehydration, but they also vary depending on whether the tests are taken from a rider while the rider is standing up, sitting down or lying down. The levels vary depending on whether the test is taken after the rider has exercised, compared to after the rider has been at rest. Perhaps most significantly, they vary depending on how the sample has been sent to the lab for analysis. If the sample has been in transit for a long time, or is not properly refrigerated during transit, the numbers are going to change. This is the likely meaning of Ashenden’s reported observation that the ACE and UCI blood numbers on the same riders don’t match up very well. (“Almost like a different person.”) This may reflect a problem with the ACE testing, with the UCI testing, or both. But it should also lead us not to take any single blood reading all that seriously. Remember, the measured increase in the Landis Hg during the 2006 TdF is roughly a 4% increase. That’s not a whole lot of increase, and probably well within the margin of error for this kind of testing. Again TBV, thanks for the analysis. "ACE is in a difficult situation," he admitted. "The UCI uses accredited labs with confident quality control. ACE and Slipstream have to rely on what they get." Millar's ACE results would require further explanation for Ashenden to explain, but with his UCI results, said Ashenden, "you wouldn't look twice." 1. Doping with undetectable EPO like Mircera. 2. Micro dosing EPO + transfusion. I don't disagree with you, and I think what I said is consistent with what you said. I wouldn't look twice at the Millar results, and to be honest I wouldn't look twice at the Landis results. I wouldn't have a problem if UCI/LNDD/AFLD established a rule saying that if a rider's Hg increases during a race, the rider may be tested further. I think they're going to end up testing a lot of riders under this rule, and I think it would be smarter to focus on Offscores. The fact that a rider perhaps should be tested further does not mean that the rider is doping, or probably doping, or possibly doping. Remember that AFLD reportedly had 60 riders on their target list for testing in this year's TdF, and I think only 3 of them ended up with AAFs (I think that two riders got AAFs through random testing -- I am not counting Caspar on this list). That's about what you'd expect from targeting: possibly around 5% of the people you target will test positive. Sure, Landis could have been doping with EPO like you suggested. Same for Millar, Vande Velde and everyone else whose Offscores are normal. You'd need a lot more data than what we have to make even the most preliminary conclusions about possible EPO use. 3. Doing nothing wrong, having natural reactions. I think the real answer here is that we do not have enough data to form a judgment of any kind. To conclude anything, we'd need quite a number more data points to be able to determine anything. One of the things I've been concerned about all along with this matter is jumping ahead of the proven data. It's fair to speculate, but there's a need to be aware when unproven speculation is converted to "assumed truth" in discussion. For the record, I still don't know for fact whether or not Landis doped with testosterone, and I certainly don't know anything about speculated oxygen vector doping. I have no choice but to accept that Landis was sanctioned under the WADA Code for T doping, but I'm not willing to concede that award as conclusive about the underlying truth value. TBV, quite right, if you're going to jump to a conclusion, your excluded possibility no. 3 is the only justifiable conclusion to jump to. In other words, the Landis data is not exceptional. TBV, you're right that we do not have the kind of data we'd need to start drawing conclusions about possible EPO use. EPO use is a tricky thing to detect. Let's look more closely at what the Offscore is intended to measure. The Offscore is looking at a scale of Hg and reticulocyte readings. Speaking in the most grossly general terms possible, we can say that in the middle of this scale is a steady state where the body has about as much Hg as it wants, and is producing sufficient reticulocytes to maintain the steady state. On one end of the scale, where the offscore is high, the body has a lot more Hg than it thinks it needs -- so the body sends signals to slow the production of the reticulocytes (which are just baby red blood cells). On this end of the scale, the body has lots of Hg and very little reticulocytes. This could be a sign of blood doping, especially if we're at the extreme end of the scale (Offscore at 133 or higher). None of the readings shown to us by TBV reach this extreme. On the other end of the scale, where the offscore is low, we have the situation where the Offscore is low, because the body is low on Hg and needs to create more. This is what we'd expect during a long stage race, where the racers' body are struggling to recover. It appears from TBV's data that riders naturally bounce up and down the Offscore scale to an extent. This seems entirely natural, as riders are generally either racing (pushing their bodies into an Offscore deficit), or recovering from racing, or trying to do what they can to build their bio systems to withstand these deficits. If you look at the data for Vande Velde and Millar, none of this data is suspicious, but you can see the numbers moving around a lot. This is the sort of thing that Tom Fine keeps saying: there's a good deal of variability between the biochemistry of different individuals, and also within the biochemistry of any single individual. What Tom says about us ordinary folk may be truer still for elite athletes. Going back to the Offscore: the problem with EPO is that it doesn't follow the rules set forth in the Offscale calculation (tradeoff of high Hg against low reticulcytes). EPO abuse "tricks" the body into producing more reticulocytes even when there's adequate (or more than adequate) Hg. So, depending on when the EPO doper is tested, the EPO doper might have a normal Offscore. To catch an EPO doper with an Offscore, you'd need to do so at a point when the doper's Hg was still high from the use of the EPO, but when the doper's reticulocytes had dropped to normal or below-normal (i.e., when the ability of the EPO to create reticulocytes had worn off). But to try and catch an EPO user on the basis of a "spiky" reticulocyte count, you have to test the athlete fairly often -- the effects of most forms of EPO are short-lived, so you'd need to do the test near when the athlete took the EPO. And note in the Damsgaard charts how infrequently the two athletes in question were tested: about 6 or 7 times a year, with a 6-month gap in the testing during 2007 (which takes up about half of each chart). That's just not enough testing to have much confidence. The "clean" athlete could have been doping with EPO between April and August of 2007, and the Damsgaard chart would show no evidence of this. Also, if you're looking for "spikiness", you're in a pretty subjective area. Notice that the Damsgaard charts also help us see when the Offscore would help catch the doper. On the doper's chart, if you look at the reading for 16/2/06, you'll see an Hg reading of about 17, and a reticulocyte percentage of 0.45, which will produce a highly suspicious Offscore of about 130 -- not off the charts, but possibly high enough to warrant additional testing. In contrast, if you measure the Offscore for a peak day like 13/11/06, you'll get an Offscore of 80 (pretty normal). You might look at the chart and conclude that both of these days look like doping, but the Offscore readings for these days look very different. This helps show the importance of timing in taking these tests, and suggests that Damsgaard did not test either of these athletes often enough. Again, we must conclude that we need to be cautious in the interpretation of this evidence. If Landis did blood dope on his rest day, you wouldn't see much change in reticulocytes the very next day. I can't put a number on it because I know of no studies, but the reticulocytes in the blood last 1 to 3 days, so after one day, there'd still be some. Moreover, the marrow has more in the pipeline. I know it can release them early if needed (faster production line), but I don't know if it can put the ones already in production on hold. It'd be nice if there were a study on how quickly the reticulocyte count will drop. Having said that, I still think that inferring* doping from very normal looking values is absurd. Especially in light of that excellent graph that TBV just posted that shows some athletes have increased hemoglobin, and by the lack of separate grouping, no doping is implied within that set. ** Yes, it is grammatically correct. Apple isn't telling you HOW to think, they're telling you WHAT to think. So there again. TBV (also at trustbut.com) kept track of the Floyd Landis doping allegations at the 2006 Tour de France. We stopped posting on 31-Dec-2008. If you're new here, start with the CURRENT STATUS REVIEW, KEY REFERENCES, GLOSSARY, or the TIMELINE. What was a daily roundup became an "irregular report" of links with specific Landis interest, with brief comment. We avoided bashing, gushing, or gross stupidity. Unless it was funny. We're still around for mail, but don't expect much or quick response. Thanks! Comments are welcome, but may be edited/moderated or deleted for propriety and relevance. The decision of the judges is final. Your milage may vary, taxes and license additional. TBV tried to be objective, making reference to all points of view. It's intended to be useful for folks of all persuasions. TBV is personally biased towards Floyd. I think it'll be a better world if he proves his innocence, and some inquisitors meet their own just ends. Interspersed between daily link roundups are pieces of commentary slanted towards understanding what will prove innocence in the discipline proceeding, and what will rehabilitate his reputation in the public eye. Make of them what you will. Agreement with me is not required, though I am right. Thanks to Free Floyd for the idea, and Groklaw for some inspiration. Marc is an American living in Paris. If someone who leans towards guilt would like to contribute directly, please inform us. Sharing a diversity of viewpoints is the best way we know of to arrive at the truth. Tom Prail, CIR False Positive?